Be a Part of the Safest Skin Care Revolution! Skin care aficionados, have you tried PUR ATTITUDE products yet? If not, you just might want to add them to your daily beauty routine. Every product IN THE PUR ATTITUDE line is dermatologist tested and approved, backed by independent clinical studies. They follow the brand’s standard for “safe beauty” as they avoid harsh chemicals, parabens, PEG’s, glycols, sulfates, petro-chemicals, synthetic fragrances and artificial dyes. I tried their fountain of youth serum and I noticed a smoothing out of the fine lines around my mouth. This serum is known to address the different signs of aging, delivering hydration, anti-oxidants and skin nutrients. It’s not greasy at all and I like to use it right after I wash my face. You just place two pump-fulls of the serum on your skin in an upward massaging motion. It goes on nicely, and leaves your face smooth to the touch. After the serum, I use an emollient moisturizer and then I’m finished with my beauty routine. You can use it once in the morning and once at night. After two weeks of using this serum, I noticed my complexion is taut and blemish-free, and who doesn’t want that? Based in Boca Raton, Florida, PUR ATTITUDE was created by a team dedicated to the research, development and manufacturing of advanced therapeutic topicals and skin care. All PUR ATTITUDE products contain only safe beauty ingredients. More than 1,300 chemicals have been banned from the company’s lab, which adheres to EU standards. 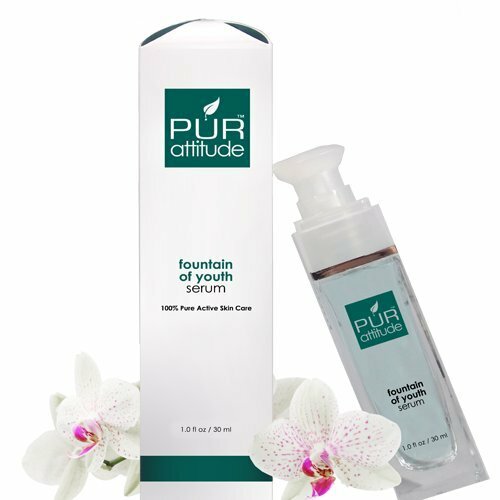 Additionally, all PUR ATTITUDE products are created with 100% pure, active ingredients and are not diluted with water. For more details, visit www.PURattitude.com.